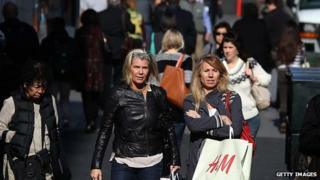 US retail sales rose in March for the first time in four months, the US Commerce Department has said. Increased spending on cars, furniture, clothing and building materials led to a 0.9% rise in overall sales compared with February, the figures show. The figures suggest that shoppers are returning to stores after an unseasonably cold winter. Core sales - which strip out spending on cars, petrol, building materials and restaurants - rose 0.3%. Economists say that sales should continue to climb because of a year-long increase in the number of people in work, and lower petrol prices. The unemployment rate has fallen to 5.5%, and the US economy has added about 250,000 jobs per month during the past year, leading to around three million more people in work. At the same time, petrol has fallen to $2.39 (£1.62) a gallon, which is $1.30 cheaper than a year ago, according to AAA's Daily Fuel Gauge.